Filters are applied to the raw data gathered by the tag, in the order specified. Entries from reports are either kept or removed in accordance with the specified conditions. Changes made by filters cannot be undone. If you don’t set up any filters, Yandex.Metrica reports will contain all the data for all user sessions. The checkbox to the left of each filter lets you disable the filter without permanently deleting it. For example, if you select the filter type “Only record traffic from” and the “IP address” field, then set the condition to “equals” with the value 192.168.0.2, the report will only display information about traffic from this address. Example of setting ranges of IP addresses: 192.168.0.0/24; 192.168. *; 192.168.0.0–192.168.255.255. only site and additional domains — To restrict the report to only page views on the site and its additional domains that are specified on the tag editing page (on the Common tab). 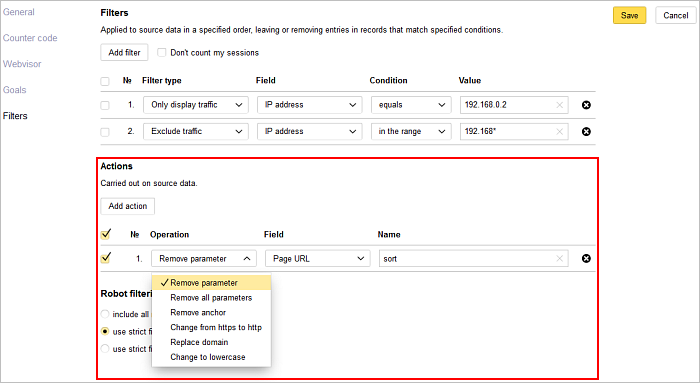 To prevent Yandex.Metrica from counting your own sessions, select the Don't count my sessions option. When this setting is enabled, the service stores the cookies of users who have viewed reports or Settings for this tag, and does not count these users when calculating statistics. Actions can be performed on all raw data gathered by your tag. They modify the URLs of your site or the referring site displayed in the report. “Remove parameter” — removes a given parameter from a URL. For example, if you select the action “Remove parameter” and the name “sort”, reports will combine the URLs http://example.com/?sort=by_price and http://example.com/ into a single URL, http://example.com/. “Remove all parameters” — removes all parameters from a URL. “Remove anchor” — removes the anchor from the URL. “Change from https to http” — all webpages in reports shown as accessible over the HTTP protocol. “Replace domain” — this replaces the domain of all webpages in a report. “Change to lowercase” — all URLs will be shown in lowercase in reports. Note. You can set 30 filters and 30 actions per tag. This setting only affects new data and does not change data that has already been collected. Robot filtering is applied to source data. Use this setting to filter information about robot traffic in reports. Whether filtration is enabled or not, information about robots that visited the site is always shown in the Robots report. Robot sessions will be included in all Yandex.Metrica reports. This filtering is performed using fixed templates for IP address and User-Agent and doesn't give false responses. When using a strict filter, only a small percentage of robots can be detected. This filtering makes it possible to detect most robots. Use this type of filtering if you have discovered dramatic surges in unnatural traffic from the Robots report data.